Our Clients Our client list includes municipalities, not-for-profits, manufacturing, retail, homebased businesses and even a duck farm. If you appreciate exceptional customer service, and are looking for a professional representation of your company that gets results, we would be happy to meet with you for a free consultation. At VPN Marketing Group we place great emphasis on customer service; taking care to listen to "who" you are and "what" you want to achieve. Many of our clients do not know what tools are available to help them grow their business, so we give them options and help them to fit their plan to a budget. It is our mission to help our customers achieve their goals. VPN Marketing Group, Inc. is first and foremost all about our clients. As webmasters for the City of Mishawaka, we saw a need for a business directory; but, knew it would be difficult for the City to administer and maintain such a site. We approached the City and learned they were very interested in helping the local businesses, and so began our partnership. VisitMishawaka.com is a multi-site directory of the retail businesses in Mishawaka. In its third year our Visit directories get over 50,000 visitors per month and offer email contact forms, google mapping, the ability to build a travel plan, and more. 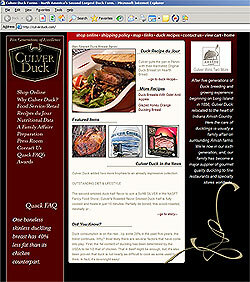 Culver Duck Farms, Inc. is a client who came to us for a website. As we worked with them to create their site, they became aware of our other services. We now create print advertisements for them, sell sheets, POS displays, banners, and more. The Equestrian Network is a client who was referred to us by one of our Austin, TX clients. EquestrianSingles.com is a social networking site that garners 3+ million visitors each month. We work closely with the owners to monitor and troubleshoot the site, to maintain the servers and database, to implement upgrades and enhancements, to manage the banner serving software and to assist in marketing efforts. We also serve as a consultant for new technologies and as marketing opportunities arise. BD Custom Manufacturing is located in Bristol, IN. The bdcustommfg.com site is unique in that while it did not require a shopping cart because BD's product line consists entirely of custom plastic extrusions, a gallery was needed to show the capabillities both in type and color. BD Custom also needed a way to highlight case studies. Olive Street Health is a health clinic serving the Michiana and Warsaw areas. Olive Street Health provides birth control consulting, pregnancy testing, STD testing, and other reproductive health services on a sliding fee basis.